This recipe really knocked our socks off, and the secret ingredient is Trader Joe’s Yellow Curry Sauce. The rich, creamy coconut milk-based spicy sauce just melts in your mouth. The combo of crunchy toasted almond slices or crunchy chopped roasted peanuts, thinly sliced green onion rings, and chopped cilantro on top is so yummy, you want a second bowl. A dollop of chutney rounds things out too with a nice sweet finish to each bite. You’re going to probably want a base grain like rice, brown rice, or quinoa for this saucy dish, so assuming you can make that separately with another meal, make extra and save the extra in your fridge for this one. About one cup of cooked rice per person is usually enough. We’ll assume you already made that rice. So let’s get started. You’ll need a large pot or Dutch oven, cutting board, knife, vegetable parer, that’s it! Heat the oil in the pot and add onion, cooking about 5 minutes til tender and lightly browned. Add garlic, cook one minute. Add everything else to the pot except rice, chutney, almonds or peanuts, green onions, and cilantro. Bring to a boil then reduce heat to low, cover and cook, stirring occasionally, until vegetables are tender, about 30 minutes. 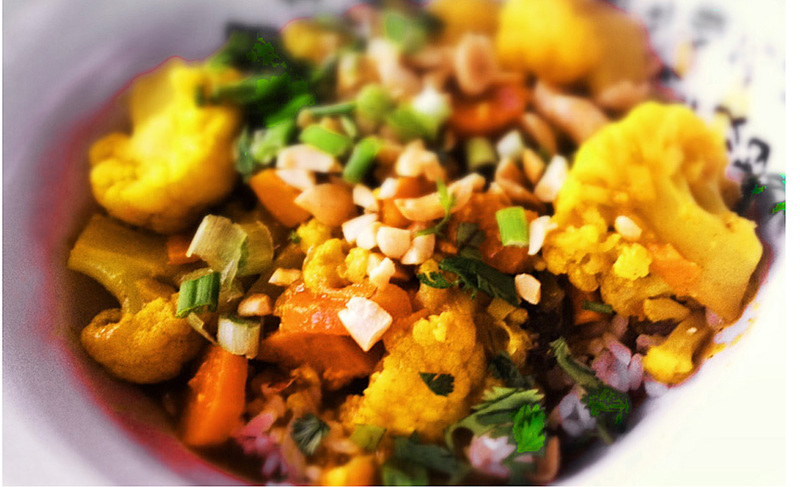 Serve in deep bowls with rice, almonds or peanuts, green onions, and cilantro on top. Have chutney available to spoon onto the mix.